Kong: Skull Island roared into theaters last week, proving once more that everyone’s favorite giant ape is still King. Starring Tom Hiddleston, Samuel L. Jackson, and John C. Reilly, the film follows a group of soldiers, scientists, and one determined photojournalist who, after crashing on the titular Skull Island, must find a way to survive and escape the monsters that await them. The film is a wildly fun ride, with enough action and humanity to please cynical audiences. The film also sets up the upcoming MonsterVerse, Warner Bros. and Legendary Pictures’ attempt to build to a cinematic universe around famous movie monsters such as King Kong and Godzilla. The second film in the franchise, the film ends with a post-credits stinger designed to tease the upcoming Godzilla: King of Monsters and Godzilla vs. Kong. The film, which is far more enjoyable than 2014’s Godzilla, also sets up a few precedents that the upcoming films should take note of in order to be as successful. One of the best elements of Kong: Skull Island is the fact that the cast doesn’t necessarily seem like your typical monster movie cast. Brie Larson, John Goodman, Corey Hawkins, as well as the aforementioned Hiddleston, Jackson, and Reilly are all talented actors and provide strong performances, even with one-dimensional characters. Jackson, Goodman, and Reilly in particular stand out, and are all clearly having fun with their roles. This is a change from Godzilla which, outside of Ken Watanabe, had less memorable performances and characters. Humans are, usually, the most forgettable part of a monster movie, which makes sense given that audiences didn’t come to the theater to watch humans duke it out. Still, the fact that the cast is engaging helps the movie. For the few scenes not dominated by Kong or his island companions, having a strong and interesting cast helps keep the story flowing and helps you care about the humans before they’re eaten or stepped on or meet some sort of grisly end. Godzilla: King of Monsters looks to continue this trend with Mille Bobby Brown (Stranger Things), Vera Farmiga (Bates Motel), and Kyle Chandler (Bloodline) -- as well as a rumored return from Watanabe -- and hopefully Godzilla vs. Kong will have an equally engaging cast playing second fiddle to the headliners. Another one of Kong’s strengths is the Apocalypse Now vibe that permeates the entire film. From slow motion shots of helicopters soaring over landscapes to scenes of soldiers moving through swamps and jungles, the film definitely draws inspiration from the 1979 classic; numerous reviews have pointed this out. And while the film is nowhere near as good as Coppola’s film (and of course, we can’t expect a creature feature to match up with it), the homages set it apart from other CGI-packed extravaganzas. While the film’s voice might be borrowed from another film, it at least crafts a unique enough tone to make it stand out from the pack. This is not to say that the references don’t almost become too much, or that future monster movies need to pick a better film to lovingly rip off. However, by playing with conventions and including a few interesting tropes, Godzilla: King of Monsters and Godzilla vs. Kong can at least separate themselves from the rest of the effects-laden blockbuster crowd by providing a unique tone and visual style. At least that will be something fresh -- even as familiar faces and monsters clash. At one point in Kong, scientist Randa (Goodman) tells a story about being the sole survivor of a battleship, the USS Laughton, that was destroyed by something in the 1940s. He doesn’t go into detail about which monster ripped it to shreds, instead leaving that up to the audience's imagination. In a way, it’s reminiscent of the plot threads that the Marvel movies will dangle for audiences; Easter eggs that set up future films and tease future characters. Since Kong is set in 1973, and works well as a period piece, who’s to say that future films in the series won’t also jump through time? It’s likely that Godzilla: King of Monsters will be set in the present day, as the previous Godzilla film was also set in the modern era. However, since there are no MonsterVerse films announced after 2020, future films could jump around in time and showcase different monsters wreaking havoc during different time periods. Be it a film that actually tells the story of the USS Laughton (a 1940s battleship vs. a monster?) or another period piece featuring some sort of crazy creature, there’s more room in experimenting with time periods. Much like playing with tones and homages, the different settings will also serve to set the MonsterVerse apart from other CGI-fests, which is something the franchise desperately needs. One of the biggest complaints surrounding 2014’s Godzilla was that it took almost an hour for the titular monster to show up. While the MUTO caused some mayhem prior to Godzilla emerging from the sea, it wasn’t enough to satisfy some in the audience. The film itself featured long stretches of time where there were no monsters on screen. That’s not why some audiences buy tickets to monster movies. Kong, on the other hand, introduces it’s title character a trim 30 minutes in. That’s enough time to establish characters and ship them off to Skull Island while still not feeling overly long. The film also doesn’t hold back from action set pieces throughout the film. There are monsters upon monsters on Skull Island, and the mayhem doesn’t stop until the film ends. If Godzilla: King of Monsters and Godzilla vs. Kong want to impress audiences, they need to take a page from Kong’s book. Introduce their monsters early and keep them present throughout the film. No hiding what the audiences came to see. Instead, keep the action scenes going and give the people what they want. Monsters fighting monsters as the humans try to survive. One of the reasons Kong is such a fun ride is because of the frequent monster appearances. This ties into the final lesson that Kong leaves for the upcoming sequels. Another complaint Godzilla received was for its grim tone. No one was asking for a comedy, but to make a monster movie without recognizing the inherent cheesiness of it all and trying to make it 100 percent serious misses the fun of the genre. Vogt-Roberts, as well the movie’s screenwriters, don’t treat Kong as a joke, but certainly don’t take the film as seriously as Gareth Edwards took Godzilla. Reilly’s Lt. Marlow provides most of the levity in the film with a zany performance that actually carries some heart. While the audience definitely chuckled at a few unintentionally humorous moments in the film, Reilly’s character earned genuine laughs at various points. Here’s hoping Godzilla: King of Monsters and Godzilla vs. Kong have similarly humorous characters. Amidst the violence and death that most certainly follows Kong and the rest of Skull Island’s inhabitants, the moments of levity and humor were welcome and prevented the film from becoming too obsessed with perceived importance. The monster movie genre itself invites the audience to laugh. By injecting a few well-placed laughs, the movies are not as tiring as they can be when the directors instead choose to make them grim mediations on humanity. Kong: Skull Island is not a perfect movie. However, it does lay groundwork for successful films in the upcoming MonsterVerse. Humor, unique tone and time period, an interesting cast, and keeping the monster mayhem going throughout the film all are key elements in what makes a monster film enjoyable, even good. Godzilla: King of Monsters can improve upon the formula, as can Godzilla vs. Kong. Hopefully Warner Bros. and Legendary Pictures will take note of what worked and move forward to create bigger and better spectacles. After all, there’s a dearth of truly great monster movies nowadays. 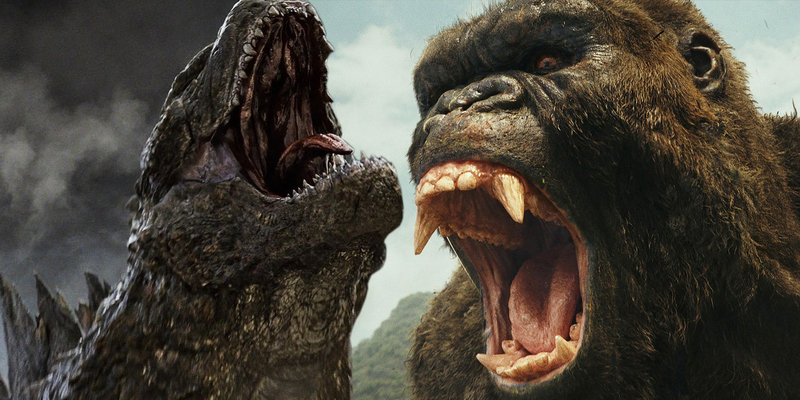 The real Godzilla vs. Kong conflict might be to see who gets that crown first.